SOURCE: AP/Mike Groll The old Office of Technology Assessment had answers to Pennsylvania’s shad problem today. That’s only one reason why efforts to revive the congressional office are gaining traction. The American shad, once a staple in the diet and economy of coastal American Indians, boasts a cult following today. Those who love to fish delight in the challenge of hooking shad; culinary enthusiasts whip up shad roe delights; local Chambers of Commerce revel in folksy, commercial shad festivals; and environmentalists glorify the shad as a symbol of hope. This remarkable fish has an impressive ecological link. Like salmon, it migrates from its saltwater ocean home to fresh river waters to spawn. The shad’s oscillating presence reflects both the health of the water and the accessibility of a river’s passageways. And today’s continuing efforts to protect shad provide a good example of the long-lasting impact of expert studies by the former congressional Office of Technology Assessment. A voluminous report prepared by OTA on fish passage technologies just before former Speaker of the House Newt Gingrich shut its doors in 1995 has gained prominence in the current crisis. The report, titled “Fish Passage Technologies: Protection at Hydropower Facilities,” prepared for the House Subcommittee on Fisheries, Wildlife, and Oceans, provides the kind of analysis that could potentially help Pennsylvania officials prevent the demise of the shad population, which at the time of its release was quite healthy due to earlier federal efforts to help the shad amid the growth of hydropower plants. The old OTA often found clarity and presented policy options by gathering up and synthesizing existing studies. Today, no such agency exists to do this. Indeed, this particular report is available today for researchers, policymakers, and the public to access for free, alongside 719 other comprehensive, technical analyses originally provided for Congress. Thanks to the efforts of the Federation of American Scientists, more than 100,000 pages of the best available analyses of the scientific and technical policy issues of the 1970s to 1995 are available online in a user-friendly, searchable format at www.fas.org/ota. It took less than $1,000 for FAS to create an online home for the formally issued reports of the OTA. It evolved from the efforts made by Princeton University to archive OTA’s reports in the late 90’s, and features information about how OTA prepared the reports, and supplemental archival materials not previously available to the public documenting the history and impact of the agency. On the site, FAS will also track attempts by the scientific community and members of Congress to restore OTA, highlighting policy discussions about OTA taking place today—more than a decade after the office closed its doors. “Its existence brought a healthy balance to the analytical resources available to both the executive and legislative branches of government,” says Michael Stebbins, director of biology policy at FAS. From 1972-1995, the Office of Technology Assessment provided comprehensive, technical analysis for Congress on a broad range of policy issues, including addictions, workplace safety, hospital technologies, and technology transfer to China. Efforts are mounting for Congress to appropriate funds to open a revitalized OTA. If it did, the OTA could delve into (among other things) the mystery of the disappearing shad before federal tax dollars are spent on speculative approaches based on perhaps poor science. The old OTA often found clarity and presented policy options by gathering up and synthesizing existing studies. Today, no such agency exists to do this. Yet despite inconsistent science on the shad’s problems, people are still investing considerable amounts of money and energy in protecting shad and other fish. In Philadelphia, for example, a consortium of local, state, and federal organizations is constructing rock ramps to permit fish, including shad, to pass around river. “Long-term restoration of recreational fisheries in Pennsylvania has a potential economic impact of $36 million and the potential to change lives,” states American Rivers’ President Rebecca Wodder. What’s more, federal efforts to protect the shad go back a half century. In the 1960s, the number of shad returning to rivers plummeted, sparking a movement to save this fish. With the passage of the Clean Water Act of 1972, rivers began to recuperate, dams were removed, and a series of fish ladders and lifts were constructed to help shad navigate around barriers in the rivers and tributaries. These efforts paid off. 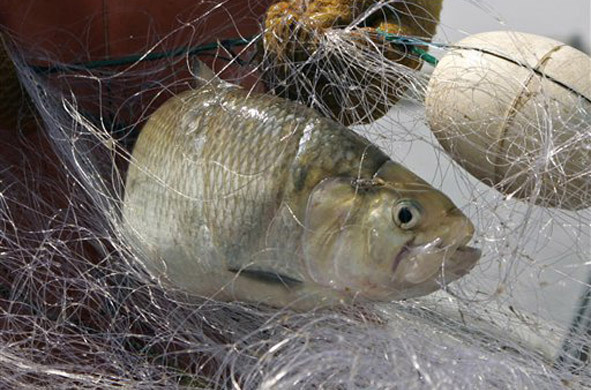 In the 1990s record numbers of spawning shad returned from the Atlantic Ocean to their birth rivers. Even though it no longer exists, the OTA’s reports could play an important part in crafting successful environmental policy like this. Congress should ensure a new OTA can make similarly important contributions in the future—before federal tax dollars to save the shad are spent on more speculative approaches. Darlene F. Cavalier (Darlene@sciencecheerleader.com) is a former Philadelphia 76ers cheerleader who studied the role of citizens in science policy as a graduate student at the University of Pennsylvania. Professionally she creates public science programs for Discover Magazine, Disney, Space.com and the National Science Foundation and is the voice of the ScienceCheerleader.com. The American shad, once a staple in the diet and economy of coastal American Indians, boasts a cult following today. Those who love to fish delight in the challenge of hooking shad; culinary enthusiasts whip up shad roe delights; local Chambers of Commerce revel in folksy, commercial shad festivals; and environmentalists glorify the shad as a symbol of hope. This remarkable fish has an impressive ecological link. Like salmon, it migrates from its saltwater ocean home to fresh river waters to spawn. The shad’s oscillating presence reflects both the health of the water and the accessibility of a river’s passageways. And today’s continuing efforts to protect shad provide a good example of the long-lasting impact of expert studies by the former congressional Office of Technology Assessment. A voluminous report prepared by OTA on fish passage technologies just before former Speaker of the House Newt Gingrich shut its doors in 1995 has gained prominence in the current crisis. The report, titled “Fish Passage Technologies: Protection at Hydropower Facilities,” prepared for the House Subcommittee on Fisheries, Wildlife, and Oceans, provides the kind of analysis that could potentially help Pennsylvania officials prevent the demise of the shad population, which at the time of its release was quite healthy due to earlier federal efforts to help the shad amid the growth of hydropower plants. Today, however, things have taken a turn for the worse. Shad showing up in rivers each spring have mysteriously dropped by more than 90 percent since the mid-1990s. “Although this particular OTA report focuses more on hydropower plants, I would have found this information very useful [today] in our efforts to improve passages here in Philadelphia’s waterways,” says Philadelphia Water Department aquabiologist Joseph Perillo. “Putting these reports online follows a real trend among scientists forming listservs and other online networks to share credible, relevant peer-reviewed reports, like this one.” Indeed, this particular report is available today for researchers, policymakers, and the public to access for free, alongside 719 other comprehensive, technical analyses originally provided for Congress. Thanks to the efforts of the Federation of American Scientists, more than 100,000 pages of the best available analyses of the scientific and technical policy issues of the 1970s to 1995 are available online in a user-friendly, searchable format at www.fas.org/ota. It took less than $1,000 for FAS to create an online home for the formally issued reports of the OTA. It evolved from the efforts made by Princeton University to archive OTA’s reports in the late 90’s, and features information about how OTA prepared the reports, and supplemental archival materials not previously available to the public documenting the history and impact of the agency. On the site, FAS will also track attempts by the scientific community and members of Congress to restore OTA, highlighting policy discussions about OTA taking place today—more than a decade after the office closed its doors. “Its existence brought a healthy balance to the analytical resources available to both the executive and legislative branches of government,” says Michael Stebbins, director of biology policy at FAS. “By publishing the OTA’s legacy in electronic form, we are preserving the investment made in its work for future users and as a demonstration of the value of the agency,” says Stebbins. “The OTA reports collected here are widely acknowledged to be nonpartisan, objective, and thorough and in many cases, they have also proven to be of enduring interest and relevance.” From 1972-1995, the Office of Technology Assessment provided comprehensive, technical analysis for Congress on a broad range of policy issues, including addictions, workplace safety, hospital technologies, and technology transfer to China. Efforts are mounting for Congress to appropriate funds to open a revitalized OTA. If it did, the OTA could delve into (among other things) the mystery of the disappearing shad before federal tax dollars are spent on speculative approaches based on perhaps poor science. So what is happening to Pennsylvania’s shad? It is not at all clear why shad are not spawning. Pollution? An increase in commercial fishing? "Heck, it could even be global warming as it affects ocean currents," says Scott Carney, another fisheries biologist. "I think everybody's just speculating now." Adds Mike Hendricks, a Pennsylvania Fish and Boat Commission fisheries biologist in trying to account for the recent and alarming decline: “It is depressing.” The old OTA often found clarity and presented policy options by gathering up and synthesizing existing studies. Today, no such agency exists to do this. Yet despite inconsistent science on the shad’s problems, people are still investing considerable amounts of money and energy in protecting shad and other fish. In Philadelphia, for example, a consortium of local, state, and federal organizations is constructing rock ramps to permit fish, including shad, to pass around river. “Long-term restoration of recreational fisheries in Pennsylvania has a potential economic impact of $36 million and the potential to change lives,” states American Rivers’ President Rebecca Wodder. What’s more, federal efforts to protect the shad go back a half century. In the 1960s, the number of shad returning to rivers plummeted, sparking a movement to save this fish. With the passage of the Clean Water Act of 1972, rivers began to recuperate, dams were removed, and a series of fish ladders and lifts were constructed to help shad navigate around barriers in the rivers and tributaries. These efforts paid off. In the 1990s record numbers of spawning shad returned from the Atlantic Ocean to their birth rivers. Even though it no longer exists, the OTA’s reports could play an important part in crafting successful environmental policy like this. Congress should ensure a new OTA can make similarly important contributions in the future—before federal tax dollars to save the shad are spent on more speculative approaches. Darlene F. Cavalier (Darlene@sciencecheerleader.com) is a former Philadelphia 76ers cheerleader who studied the role of citizens in science policy as a graduate student at the University of Pennsylvania. Professionally she creates public science programs for Discover Magazine, Disney, Space.com and the National Science Foundation and is the voice of the ScienceCheerleader.com.